Zemez theme is built as a WordPress theme, so you need to have WordPress engine installed first. 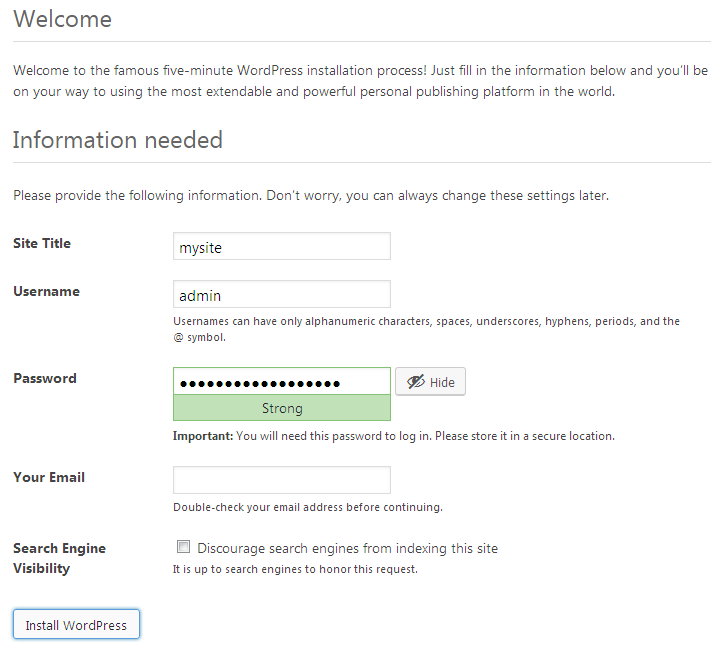 If you have not installed it yet, please refer to the WordPress Installation section. Template Extraction on MAC OS. WordPress engine files should be uploaded to the root directory on your server. It is usually named www or public_html. Uploading Files to a Server with cPanel. Creating a Database with BlueHost Server. It is recommended to use the default "wp_" database table prefix for the proper sample data installation. If you have entered the correct details, you will see a successful installation message and the WordPress dashboard access button. Manual WordPress Installation to JustHost Server. 1. Extract the template package. 2. 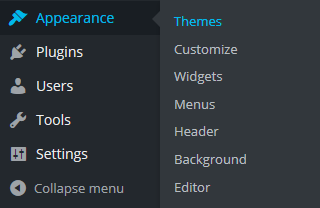 Navigate to the Appearance > Themes section at the admin panel of the site and open the theme folder. 3. Locate the archive named as theme-name.zip and install the theme by pressing Install Now. 4. Next please press on Activate link. After theme activation you will get a notice which offers you to install Cherry Plugin Wizard. 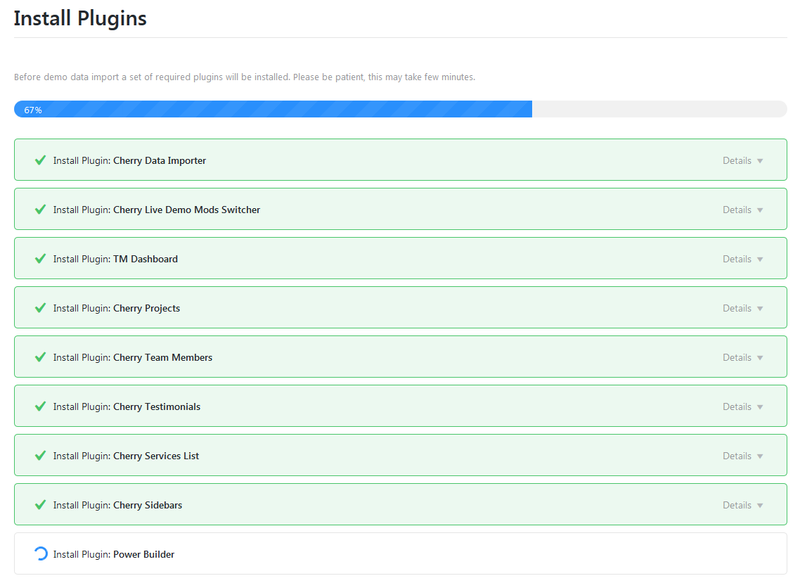 To continue plugins and demo contents installation with Cherry Plugin Wizard just hit Begin installing plugin link. You will be transfered to the page where you can select the needed plugins. Then please click on Install link. 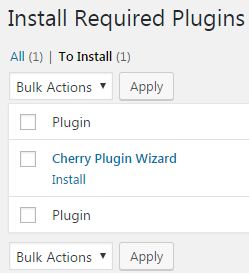 After installation and activation Cherry Plugin Wizard you will get a notice which offers you to continue the plugins and demo contents installation with Cherry Plugin Wizard. Then click on START INSTALL on the top of the page to start installation of the recommended plugins. On the Wizard Home page you can check if your server configurations meet WordPress minimal requirements. If any doesnt't meet you can continue the installation process, but it will take more time and can drive to bugs. If your server configurations meet WordPress minimal requirements please click on NEXT link. Green Install Plugin box means the installation process has been successfully completed. Red Install Plugin box means the installation process hasn't been completed. Press on Details link you will see where is the problem and please refer to Zemez Support Portal. After plugins installation you will get a notice which offers to append demo content to your existing content or completely rewrite it. When you have taken the option please click on START. If you select Replace my existing content with demo content your whole content will be completely and irreversibly deleted! If you select Replace my existing content with demo content you will have to enter your password to confirm and start content replacing and importing sample data will start. On this step Cherry Plugin Wizard regenerates thumbnails for all imported images. This process may take some minutes. Import is finished. Cherry Plugin Wizard offers you to select options VIEW YOUR SITE or CUSTOMIZE YOUR THEME. To use this method, you need to have access to your WordPress site files on FTP through the File Manager of your hosting control panel or an FTP client like Filezilla, CuteFTP, Total Commander, etc. Unzip the theme-name.zip files to any folder on your hard drive (first, right-click each of the .zip files, select Unzip to theme-name respectively, so you get the one folder called theme-name). Upload the theme-name folder to the /wp-content/themes/ directory on your FTP server. Log in to your WordPress admin panel (add /wp-admin after your domain name in the browser address bar). Go to the menu Appearance > Themes . Under the Available Themes section find theme-name and activate it by clicking the Activate button. If you need to install plugins manually, you can do it this way. you can also upload the plugins from your PC if you already have them on your computer in .zip format. Just click on upload plugin button and choose the needed files. For installing the sample data manualy please follow the instructions listed below. Open the theme/manual_install folder of your downloaded template package. Upload the uploads folder to the wp-content directory of your WordPress installation, accept folder(s) replacement. Please note that your images may be replaced with sample images. Open the theme-name.sql file that is located in the theme/manual_install folder in any text editor (preferably Sublime Text or Notepad) and replace all instances of your_website_url_here with your website URL in the entire document using the Find and Replace tool (hit Ctrl+H hot keys to open this window). E.g. : http://www.mywebsite.com. Please, make sure that you do not have the forward slash / sign at the end of the address and the url starts with http://www. Save your changes and close the file. 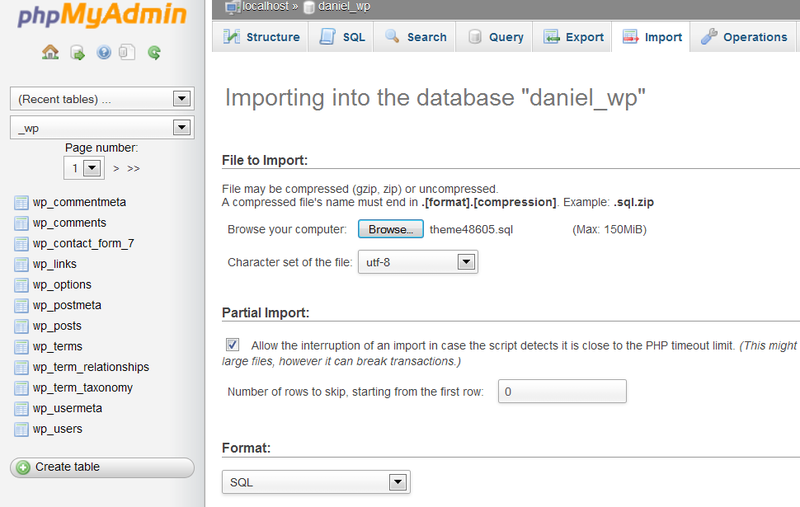 Now you can import the dump file with the phpMyAdmin tool or some other database management tool. Importing the SQL file to your database will overwrite your existing content and website settings. DO NOT import the SQL file if you want to keep the existing content. Always back up your database before performing any modifications. 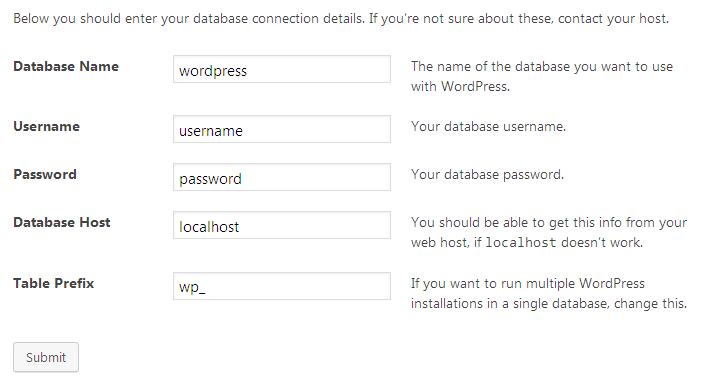 Open your WordPress database using a database management tool. Usually, the database tool is called PhpMyadmin. Go to the Import tab and import the .sql file. Navigate to WordPress dashboard and go to Settings > Permalinks. Refresh your home page. That’s it, the template has been installed with demo sample content. Manually replacing your current version of Conceptix with an updated version is as easy as 1-2-6! First off, you’ll need to download the updated version of the theme, which includes both the main theme and the child theme (which serves as a backup for all the custom changes you make to your styles etc). Next on, installing it, the child theme and export-import steps are due. - save the wp-content/themes/Conceptix folder (duplicate it), just so it stays somewhere on your web server, let’s say in a folder named main Conceptix backup. Afterwards proceed to the Appearance > Themes, switch to any other default Wordpress theme as your current one, and be sure to delete the Conceptix theme from that list. - after that, repeat the same steps for the Child theme, which you’ve previously unpacked from that same file as the main theme. After installing this updated Conceptix theme anew, proceed to update the Plugins, by going to the sidebar on your left > Updates. Then tick all the checkboxes for the listed plugins and click the Update All button at the top. - click the Add new button and click Upload theme. Following that, to save your custom styles, locate the main Conceptix backup folder on your web server (1.2 in the list of steps) > Styles.CSS file > and copy those parts of the code that you’ve changed there into the Styles.CSS file that’s located in the new folder of an updated Conceptix version.